Yes, you can keep pedaling to work all winter long. Winter Bike to Work Day is coming up on Friday, February 9, and you can commute by bike all year long. If you’re new to winter bike commuting or just need a little encouragement to keep it up when the mercury drops, this is the day to make it happen. Use this map to find more than 35 events listed around the state. Plus, you’ll be in the good company of fellow winter warriors who braved the cold on two fewer wheels. Those adjustments come primarily in the form of bright clothing and bicycle lights, due to short daylight during winter. A warm pair of gloves, a light wool hat, helmet and layering should cover the basics. If there’s snow or ice on the ground, avoid mishaps by using slower speeds and maintaining an upright position at all times, especially when turning. 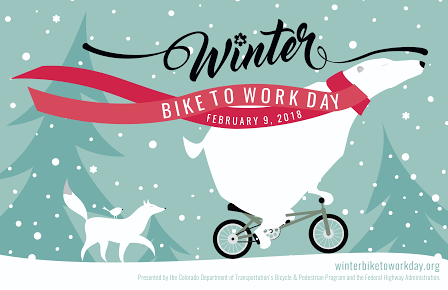 Check out more information on CDOT Winter Bike to Work Day for more info. Ready to give it a try? Commit to ride at winterbiketoworkday.org. Colorado joins thousands around the globe taking part in International Winter Bike to Work Day, celebrating the money-saving, calorie-torching, stress-busting adventure that is winter bike commuting. Next Story → GET OUT & PLAY IN PALISADE!